I’ve been meaning to write this post for a VERY long time, and here I am, sharing it finally right before Lucy turns 6 months. Oops! Better late than never. Anyway, a lot of pregnant friends have reached out asking about what to put on their baby registry, so wanted to finally compile my list! I’m going to share what we added to our registry, what we used/didn’t use, etc. We have a small apartment, so I really tried to be mindful of what products we registered for, and limit the number of large baby items we received. I also wanted to ensure that the baby items were ideally (1) functional, (2) easy to store away and (3) ideally, aesthetically pleasing. 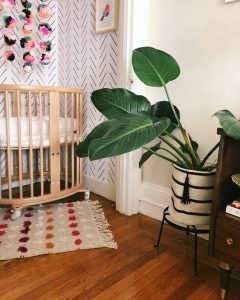 Basically, I didn’t want our already small space to be completely overrun with baby things, but instead, integrate “baby” into our existing space. Note that I didn’t include anything about clothes + accessories, although I did register for some specific brands. No matter what, you will get a ton of clothes, and people tend to not follow the registry for clothing gifts anyway. ? ?‍♀️ I also didn’t include toys/books in this list. I have a ton of our favorite baby books listed in this post, and will do a follow-up post about our favorite baby toys sometime soon. ? Without further ado, here’s my list of baby registry essentials! Wraps, slings and carriers – I registered for a Wildbird ring sling, a Solly baby wrap, and a more structured LilleBaby carrier. I received two Wildbird slings, two Solly wraps and the LilleBaby, and since, have acquired/bought 2 more Wildbird slings and 3 more Sollys. ? I’m really obsessed with them and love wearing Lucy! She’s in either the Wildbird or Solly at least once every day, so…this is definitely a top used item around here. I haven’t used the LilleBaby yet, but Eric uses it pretty regularly. Photos of Lucy in the Wildbird sling here and here (and also below) and in the Solly here and here. Bumbo floor seat – not for newborns, but great for when baby is 4M+ and starting to sit up on their own! We have this with accompanying tray. Bouncer – we opted for the SkipHop Multi-Lift Adjustable Bouncer. We used it a little bit early on, but now as she’s a bit older, we use it several times a day! This one is nice because it completely folds/breaks down, so super convenient for easy storage in small apartments, like ours. This is the only “baby contraption” we have in the apartment, as we opted to not get a jumper or Exersaucer. It’s worked out just fine for us! Sound machine – we were gifted two, but now just use our iPad with a Spotify “rain noises” playlist on repeat. We found that the iPad was easiest to keep charged and stayed loud entire night. (Yep, learned this the hard way 2x when sound machines stopped in middle of night and Lucy woke up). I did buy this small portable sound machine after a friend’s recommendation and we use it all the time in the car! Wooden Activity Gym – another beautiful and functional item! I LOVE this and we get compliments on how cute it is every time someone comes over. We started using this when Lucy was a few months old and she still plays with/under it. Again, I was/am aiming for not a ton of super loud/bright/plastic/bulky baby items, so this definitely fit the bill in terms of form and function. Pictured below. Dockatot – obviously a splurge, but so nice and so happy we received one! I’ve heard good things about the SnuggleMe Organic lounger too. The Dockatot is technically for co-sleeping, but we had Lucy sleep in this inside her Moses basket, in the bed, on the floor, really everywhere. 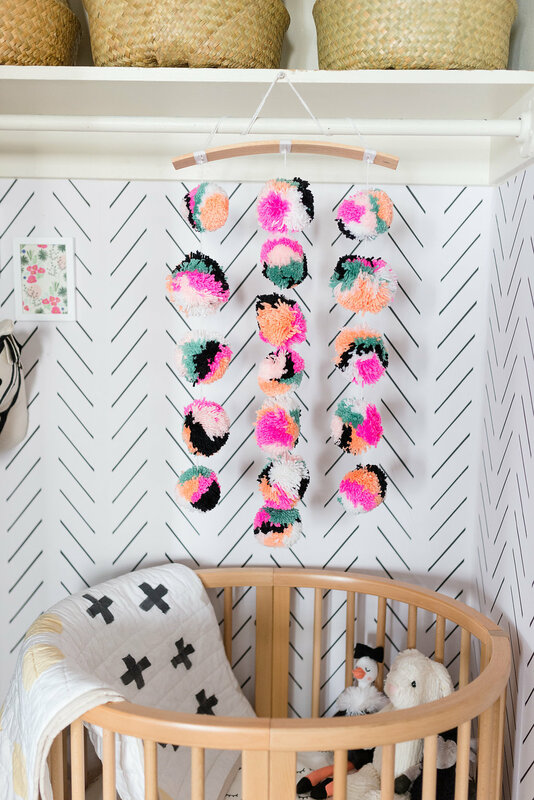 A huge plus is that you can remove Dockatot cover to easily wash.
Rock n Play – I didn’t originally register for this because I thought they were ugly and just an “extra baby thing.” Boy, was I wrong. Yes, this thing isn’t pretty, but IT WORKS. There’s tons of variations, but we actually bought ours secondhand off of Facebook Marketplace for like $30 when Lucy was like 3 weeks old, and I’m SO glad we did. Lucy slept in this thing for probably 2.5 months and ours vibrated and rocked to sleep. Truly magic and in my opinion, a necessity in those really sleep-deprived newborn days. I personally wouldn’t buy one new or full price and you can get tons in great condition secondhand, since people only use these for a few months. 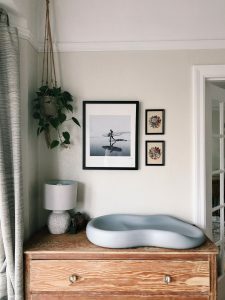 Moses basket & rocking stand – I was eyeing the Plum+Sparrow Moses baskets pretty much from the second I found out I was pregnant. They are super hard to score, but my sisters were able to snag one! We used this as a bassinet for Lucy to sleep in next to our bed in the super early newborn days and now, she just hangs out in there. I bought this Moses basket stand from Jolly Jumper on Facebook Marketplace. Pictured below. Stokke Mini Crib– perfect for small spaces and so pretty. We have it in the “Natural” color and I’m so glad we registered for this crib, and received from my parents. I have several Stokke Mini crib sheets from this Etsy shop. You can see our crib with the Dockatot inside in the photo below. Swaddles and blankets – you can’t have too many baby swaddles and blankets! We religiously swaddled Lucy and still use swaddling blankets daily. Here’s a post all about my favorite swaddles/blankets! NUNA MIXX™ Stroller & PIPA™ Lite LX Infant Car Seat Set – this is the stroller and carseat we have and LOVE it. It comes with *everything* you need – carseat and carseat base as well as the stroller. The stroller has a HUGE basket (perfect for #allthethings) and is sleek and so easy to maneuver. The stroller “seat” is removable (so you can click in the carseat) and also has several options (front facing, rear facing, fully flat bassinet). It’s amazing. Our in-laws gifted this for us during the Nordstrom sale (when it’s ~$250 off). The stroller is pictured below! Mountain Buggy Nano Travel Stroller – we didn’t register for this, but ended up getting it before our trip to Austin and SO happy we did. We absolutely love our NUNA, but wanted a super easy-to-fold and lightweight stroller for traveling, especially when we’re in Europe this summer. SO happy we bought this. We use this when traveling and keep it in the car, and keep our NUNA in our apartment lobby for walking around SF (which we do regularly). Stroller Organizer – we registered for a different one, but ended up buying this SkipHop stroller organizer because it fit our stroller the best. Perfect for holding keys/coffee/water/chapstick/phone/#allthethings. Car Seat Cover – definitely an essential for us! Lucy gets so distracted, so good for her to be covered to nap on-the-go. We received one and now have two (in case one is in laundry, lol). We have one from Copper Pearl (can also be used as a nursing cover) and one from MilkSnob. Baby Car Mirror – Lucy LOVES staring at herself in the mirror, so keeps her happy in car and nice for us to be able to see her from the front seat. BundleMe – this is a super cozy and soft car seat cover. Perfect for winter babies (or any SF babies). We used nonstop in January/February. Fawn Design Diaper Bag – this is a backpack style diaper bag that is so pretty and stylish and I always get compliments on it! High chair – we don’t have a ton of space and I didn’t want a big, bulky high chair. We registered for and received this Inglesina high chair that hooks onto our dining table and love it! Bibs – once baby starts solids, you can’t have too many bibs! The silicone ones like this are easiest to clean up, but I also love our MatiMati ones (8 bibs for $20), and the SUPER cute Little Unicorn ones like this. I *try* to keep the “cute” bibs for teething/drooling rather than eating because BABIES ARE SO MESSY. Bottles – I did research and registered for three types that I heard great things about — ComoTomo, Avent Natural and Lifefactory. As you know from IG story, not a bottle fan and we ended up trying all of them without luck. She finally *does* accept a Lasinhoh bottle. I’d recommend registering for a variety pack and NOT BUYING/REGISTERING FOR TOO MANY DIFFERENT BOTTLES. You will have so many bottles leftover that you don’t use (or, what my friend calls “a bottle graveyard”) ? Baby Bottle Cleaner – we got this Munchkin stainless steel one and it doesn’t bother me to have it sitting out because it’s not bright green/blue like all of the other ones out there…? Bottle Drying Rack – bottles and pumps come with so many parts! We got this clear bottle drying rack. Burp Cloths – very important. We have some from Burt’s Bees and also have like a 20 pack of these plain, super absorbent ones. Baby bathtub – we registered for and received the Boon Soak Infant Bathtub. We used it once and gave it away because Lucy preferred to take baths with me instead! It doesn’t bother me at all, and actually really fun for us to take a bath together for now. ? Bath products – our favorite brands for baby shampoo, body wash, etc. are Tubby Todd, Honest and Burt’s Bees. 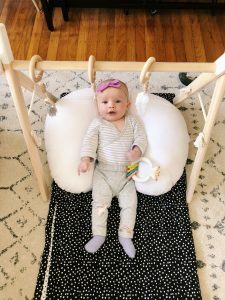 Keekaroo Peanut Changer – obsessed with this changing pad. I love how modern it looks and even more, LOVE that we can easily wipe it clean (vs. having to wash and swap out changing pad sheets). We have this on top of a dresser in our room – see photo below. Ubbi Diaper Pail – we almost didn’t get one of these because I thought it was “just another baby thing” BUT so happy we did! Changing Mat – I love our leather Gathre changing mat. Easy to fold into diaper bag and wipe clean, plus looks so pretty. This is such a great, simple baby shower gift! Wipe Warmer – we didn’t register for one, but ended up buying one at 2am on the Amazon app…because no one wants to deal with a baby screaming at 1:45am because of cold wipes. Probably not a necessity, but very, very nice to have, especially in early days. Humidifier – adds moisture to the air, so especially helpful in the winter or when someone is feeling sick. It’s helpful for sinus congestion, sore throats, allergies, colds, dry skin, etc. Air Purifier – cleans up stuffy air in our apartment, especially helpful if you have a pet or live in an old building, like we do! Windi – not glamorous but incredibly effective and brilliant product for “helping baby pass gas.” Basically a lifesaver when she was pretty gassy early on. NoseFrida – another brilliant product from same brand above. This is great for when baby has runny or stuffy nose. We use all the time. FYI, here’s the (now very outdated) link to our original baby registry.